R.T. Wolfe writes romantic suspense stories that manage to touch the hearts of her readers as well as their intellect. She lives in the Midwest and is a loving mother to her boys. She enjoys working in her gardens and spending time training her Golden Retriever and writing in and around each of these. If done tastefully, children add a new level of suspense to a storyline. Their innocence and helplessness bring out the mother-bear in many of us. Adult family and friends add layers of trysts, suspicions and mold the main characters. In Black Creek Burning, Nathan Reed inherited his young nephews after the death of his brother and sister-in-law. He was at the pinnacle of his woodworking artistry career. His work became nationally renowned and sought after by politicians, the rich and the famous. However, after four years of trying to juggle his lifestyle and fatherhood, he realizes he’s failing as a parent. Determined to keep his promise to his brother and to his nephews, Nathan sells his woodworking studio and moves back to upstate New York in order to be closer to the only other living relatives the boys have left, their grandparents. He finds a historic, rundown farmhouse and decides to move in with the intention of rebuilding the beauty in tandem with building his relationship with the boys. Behind the farmhouse and over Black Creek is a classic Victorian and an odd brunette. Brie Chapman witnessed the murder of her parents. It was an arson that had been meant for her. As a way of coping, she counts on the teaching job she adores by day and the landscaping business she owns by night. She also counts on her family and friends, although she keeps them an arm’s length away. What she hadn’t counted on was Nathan Reed and his adorable nephews. They have a clever way of maneuvering around her hard shell and into her heart. As much as she tries to stuff the unsolved murder in her subconscious, Nathan seems focused on solving it. But today I’m not writing of the staggering Nathan Reed or the aloof Brie Chapman. I’m writing about the secondary characters and how they add a depth in Brie’s need to allow Nathan to open her heart and help her learn to trust the people who love her. The children bring warmth and the possibility of family, increasing the yearning for a happily ever after. The older of the two nephews becomes stuck in the middle between Brie and the killer who’s trying to finish a failed attempt on Brie’s life. The need for the main characters to protect and connect stirs more emotion and passionate need. So fun. I hope you enjoy it. 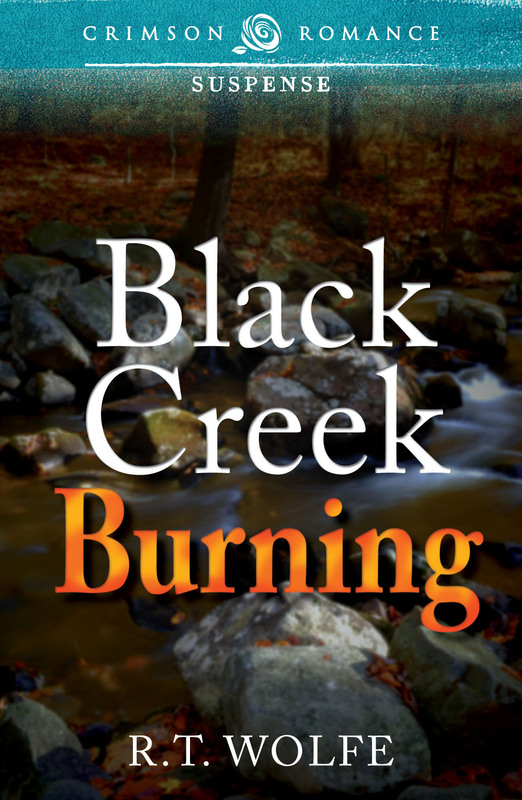 Black Creek Burning is the first in my romantic suspense Black Creek Trilogy. Set in upstate New York, it’s a story about taking chances with your heart… and about family, trust and passion. Witnessing the murder of her parents was a brutal day for Brie Chapman. Learning her parents died in her place was almost unbearable. It took her years to overcome and move on as no suspects were found. Unknowingly, she ignites the dormant killer into coming back to finish the job. Nathan Reed moves in behind her with his two adorable nephews he’s raising as his own. Patiently, he transforms Brie from an icy self-proclaimed independent into a woman willing to accept not only the help of a strong man, but the love of a family. “Mom! Dad!” she screamed and tumbled inside, spotting them almost immediately as they ran down the long upstairs hallway. Her parents yelled her name as they reached for the bedroom door. She couldn’t stop gasping for air long enough to tell them to stop. She wasn’t in there. Didn’t they know? They needed to get out of the house. Couldn’t they smell the smoke? The above listed giveaway is hosted by the author. Visitors names are entered once for each blog they visit. 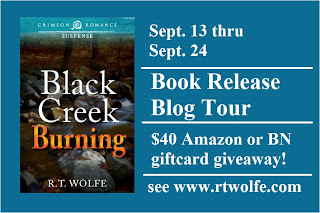 A drawing for the $40 Barnes and Noble or Amazon giftcard prize will take place the day after the September 24th release of Black Creek Burning. Thank you, Just Romantic Suspense, for having me here today! Thank you, Lynda, for your kind words and I hope you enjoy it. You have a wonderful cover RT. Will do, Janet! Thank you for stopping by! This sounds like a great story. Love children in stories. You're right about the Mama Bear coming out. :) Wishing you all the best. Thank you for sharing with us... I love when secondary characters add so much more for a story... I am one that does enjoy books with children in them. Sounds like a book I would truly like. I appreciate your input and your constant support. Thank you. I would certainly love for you to give Black Creek Burning a try. I've been fortunate enough to have had great reviews so far and I hope you enjoy it, too. Sounds really great! I look forward to reading Black Creek Burning and am putting it on my wishlist!!! Thank you, Martha. You made my day! I love children in stories. They add such a unique element to the story. Pets do as well! Thanks for the post. I need to go check out your website to get to know you a little more. Love meeting new authors here at JRS. Thanks. Thank you, Amy! I've such a food time with my website. I love paying it forward and I have so many to do so for. I hope you enjoy the site! This sounds like a wonderful read. It's definitely going on my TBR list. I can't wait to check it out! I appreciate your interest and truly hope you enjoy it. I really enjoy the idea of children in stories... but so often children in fiction are actually ridiculous--too childlike, barely characters, using either unrealistic baby-talk or, worse, acting far far far too old for their age. You handle your young secondary with sophistication and skill. The way Brie connects to the young boys is especially endearing. Not all of my work includes children, but they added so much to Black Creek Burning. I am so glad you liked it! I'm looking forward to reading BLACK CREEK BURNING. It looks amazing. Thank you, Marybelle. I have 3 days from today until my release. I'm scared to death. LOL! I loved the scenes with Duncan, Andy, and Rose, and the way Brie handled the boys, who were fragile after their loss. I love the way Duncan and Nathan's relationship grew and changed. Family is such an important part of our lives and is such a vital part of a romance story, as far as I'm concerned. Can't wait for Books 2 & 3. I want to be one of the firsts to buy them!